It began with a dream on Boxing Day 2011. I’d finally got a chance to have a sleep in the middle of the day. I’ve been a lucid dreamer since a young age, and in the past 6 months had taken my natural inclination to wake up in my dreams deeper through joining a lucid drea,ing group that had introduced me to some Tibetan Dream Yoga techniques. This had taken my dreaming to a new and exciting level of exploration, but recently when I’d got lucid I would try too hard to control things and hit a wall. On this day something was different, perhaps because I was more relaxed and open, sleeping unexpectedly in the middle of the day. My partner had taken our older daughter for a walk, and put our baby son to sleep in his cot just before he left. And I slept, like I haven’t slept for months, surrendering into a deep, dream-filled, uninterrupted sleep for a good three hours. I let go. And then this dream came. 1. I can leave the flat! 2. It is scary to leave. Somehow I am back in the flat with my children. It’s hard to concentrate on doing anything with the dream because they are active and young – need looking after. I slip in and out of awareness of the dream. Then we are on the roof terrace of the estate. I spot a small, low hole in the wall. I am afraid to look through or enter it. I may get stuck or lost. I look through it anyway. I see a sparsely decorated boy’s bedroom. There is a desk and a single bed with a blanket that the boy is sleeping on. Suddenly the boy in the room is out with me on the terrace of the flat. He reminds me of my first proper boyfriend when I was 14, who was a slacker Peter Pan type (immature, no growing up). I am fully lucid now. But I do not know what to ask this new arrival in my dream. Frustrated by my lack of grip and clarity of purpose in the dream, I think of my PHD thesis which I have started working on again and am determined to finish, but am struggling with. So I ask for help with my work. He shows me a bunch of animated cards, laid out on the floor. I study them. The first set are about race. I am grappling with this issue in my thesis. It is about music and identity in South Africa. Race, and changing definitions of it, are a critical part. The cards tell me if I can make sense of race, the thesis will fall into place. There is another set of cards but I don’t know what they are about. Then the boy shows me a set of shark’s teeth. It is a powerful object. Unexpected. I get a shock. I draw the teeth because they are so strange and powerful and I feel I need to remember them. They are teeth, but also a jaw. They look like they are made of bone and stone. There are four teeth. In the dream I ponder their significance, “Perhaps I need to get my teeth into my work” I think. Then I decided that I should go and meditate while still inside the dream, but I wander out of lucidity. I have not meditated much since the birth of my son 6 months ago. 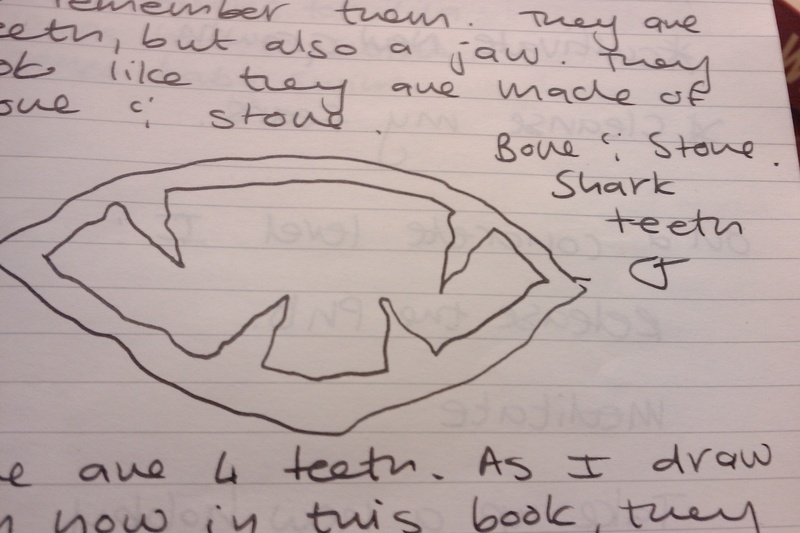 As soon as I woke up, I wrote the dream down in detail, along with a sketch of the strange teeth. The following night, nicely tucked up in bed and as I was drifting off to sleep, I heard a clear and strong disembodied voice saying the word ‘Tallard’. I was seriously tired though, did not feel like writing anything down and tried to carry on going to sleep, but this voice persisted with ‘Tallard’ on repeat. Damn! I reached for a pen, and in the dark scrawled the word in my notebook, underlining it. Then sank into a deep, lovely, dreamless sleep. The next day I remembered the voice and the word, and thought I should google it and see what came up. I went online and looked up ‘Tallow’, ending up with an explanation of candles made from animal fat used in the olden days. Time to shed some light on the thesis! End of story! However, when I got into bed that night, and actually checked my notebook, I saw that I’d remembered the word wrong. It was ‘Tallard’, not Tallow! So I googled again, and found a small French hamlet near the Alps called Tallard. Was this a place I needed to visit? The next website on the list was for a woman called Julie Tallard Johnson. I was amazed to see that she happened to be a psychotherapist, with a specialism in writing and dreamwork! Her practice was based in a little town called Prairie-du-Sac in Wisconsin in the USA. Her website was incrediable, almost as though it had been designed with my interests, spiritual background and work needs in mind. It combined Buddhist, Native American and Therapeutic Psychological wisdom with pragmatic and useful tips and tasks for living the Writer’s Life. Over the following few days, I used loads of her suggested excercises, and did indeed find it helpful with writing my thesis. The dream had really answered my question asking for help with my work! But… I could not shake off the sense that there might be more. The website contained a contact email address. Did I dare email Julie Tallard with my crazy story? I tore out the page I’d written ‘Tallard’ on in my notebook the night I heard the disembodied voice, and wrote underneath ‘Email Ms Tallard’. I then promptly used the same page to write my to-do-list. This list kept me good and busy for a month, and I kept putting off emailing ‘Ms Tallard’. A month passed and I still hadn’t done it. The monthly Lucid Dreaming group was on, and my sister and I set off at the last minute, heading to The Academy of Dreams, which is tucked away in a little side street in Euston, next door to an Islamic travel agent and round the corner from a lap dancing club. Only in London can these kinds of proximity occur! We arrived late, and I took the only seat left, next to a man who was new to the group. I shook my head and addressed the group, “I guess this means I have to contact Ms Tallard….”. Yup. It surely does. You can’t keep kicking a gift horse in the mouth. Miracles are wonderful, but what comes next? What do you do with the gift? The next day, I sent the email, detailing the entire experience from lucid dream to disembodied voice to sitting next to the guy who drove through Tallard in France. Within a few hours I had received a response. Dominique, Wow. LOVE that you took the time to share your dreams with me, and the meaningful coincidences. I am also glad you followed through on your intuition and dream. Some of my ancestors come from Tallard France. My mother has been there. I help people on their spiritual and writing pilgrimages, both via the internet and in person. I am glad that my musings on my web help, they are meant to. Have you gotten my book, Wheel of Initiation? I ordered The Wheel of Initiation. In the correspondence that followed with Julie, I described the struggles I had had with writing my thesis, and found her insight powerful and succinct. And things began to move into place in subtle ways, as they had been doing for many months anyway, just now they were gathering in clarity. When the book arrived, it was as if I had called it to me. In a most ordinary and practical way. Because the pragmatic exercises, clear language and insights of richly connected spiritual lineages where exactly what I needed. A framework to facilitate my own process of transformation. This was what I had asked for back on Boxing Day when I had asked for help in my dream. I had framed that request in terms of the work I was doing on my thesis, but it was now so clear that something deeper in me was asking for help in a much bigger way. Help with the work of clearing out the pain of the past and making space for a new way of living to enter. Awakening to the potential of living my Life with responsibility, integrity and joy. Acknowledging the connection of all of life. This precious, fleeting, beautiful gift. Thank you for isolating this text and letting me look back into my own words. I read your e mail on Thursday morning while in the midst of some library work, and that night I had two powerful lucid dreams, one after the other. I asked to be shown something important (well, tried to! ), but the revelations were inconclusive, and I found staying with the dreams hard work. The following morning I discussed the dreams with my sister who suggested that I could try asking to see my inner teacher, and indeed, could make this intention known in the waking world as well as the dream world. So I did. Your book ‘The Wheel of Initiation’ arrived in the post the next day. I put it in my bag and then left the house and went for Qi healing, a gift from a friend, and a healing technique I am not familiar with. It was a powerful experience that gave me enormous relief from some physical pain I have been holding. I felt light as a feather and super open. When I started reading the book later that night, I had to smile when I read the bit about finding your inner teacher! I see more and more how even with incrediable coincidences and serendipitous dreams that show the way, it is still down to me. I have to do the work. I have to write! And yes, that resistance pushes hard. I have to say it though. I stand on the edge of the woods and I am terrified. It is the same sense of vastness I experience when I become lucid in my dreams and have no idea how to engage with the power. I am very very scared of what I’m being called to do. And also not. Does that make sense? I can’t ignore this. It is a clamouring, laughing thunder that is rattling my waking and sleeping worlds. But that inner critical voice assures me that I am sure to fail at this. Too lazy. Too busy. Too afraid. Incapable of discerning the difference between an addiction to comfort and the necessity for rest. I am aware I hold a deep belief that I have to work extra hard to get anything. So, I am using your book as a template and a guide. I’m giving myself a year to work through it piece by piece, bit by bit. I see from your introduction that it uses tools other study has prepared me for. I’m shaking my head as I write this because THIS IS WEIRD!!!! I set up a blog today to aid this process. It was a lovely creative act, yet I also felt super resistant and critical! Scared that I am tricking myself and using this to avoid doing other work, like my thesis. Because my time is so limited. Then I remember I have given this a year. It has time to happen. It enhances other kinds of work. Bloody hell Julie Tallard! Anyway, thank you for engaging with me. Thank you for your book. I’m scared, and I’m also very looking forward to those juicy slices of time I carve out for this. My Year of Initiation had begun. And I continue to live it, imperfectly, but turning up anyway.